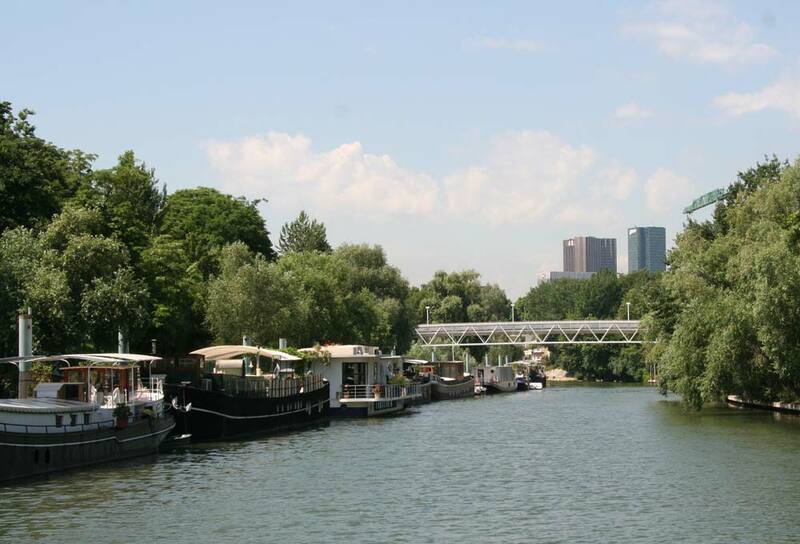 As there are few suitable stopping places between Rueil and Paris, we decided to make this stage of our passage in one leg - the 40 or so kilometres being perfectly reasonable for one day's cruise. The weather continued to be a complete mixture of hot sun, blustery winds and torrential downpours, so we were constantly adjusting the canopy and trying to variously keep cool or dry. 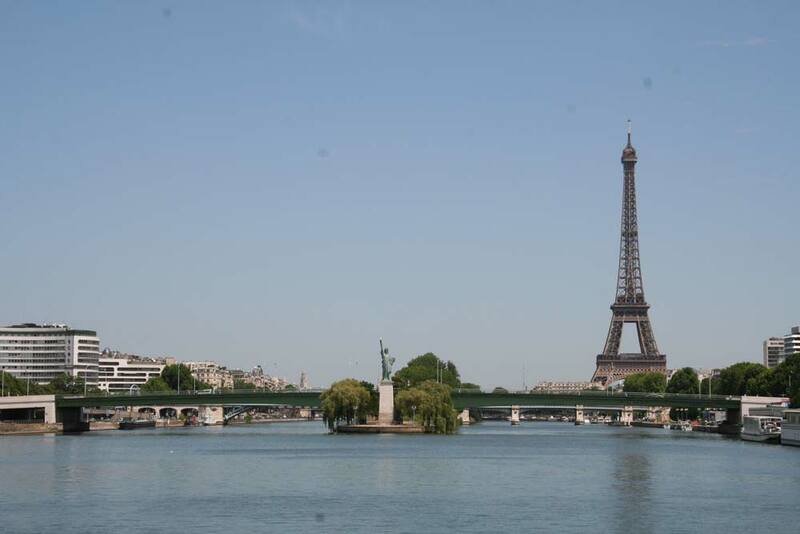 Whilst bridges on the lower Seine are few and far between, as we neared the city they became ever more frequent, and as we were trying to log and photograph them for updating CMap's electronic chart we were kept busy during the voyage. The only lock on this leg is at the half way stage at Suresnes, and the lock-keeper locked us through quickly and efficiently, giving us quite a job to hang onto the ropes. We took some of the narrow backwaters, rather than sticking to the main channel, which are often home to some elaborate, or not so elaborate house boats. Even on this route, none of the bridges we encountered were less than 6 metres, so we had no problem with air draught and did not have to disturb our sun canopy. 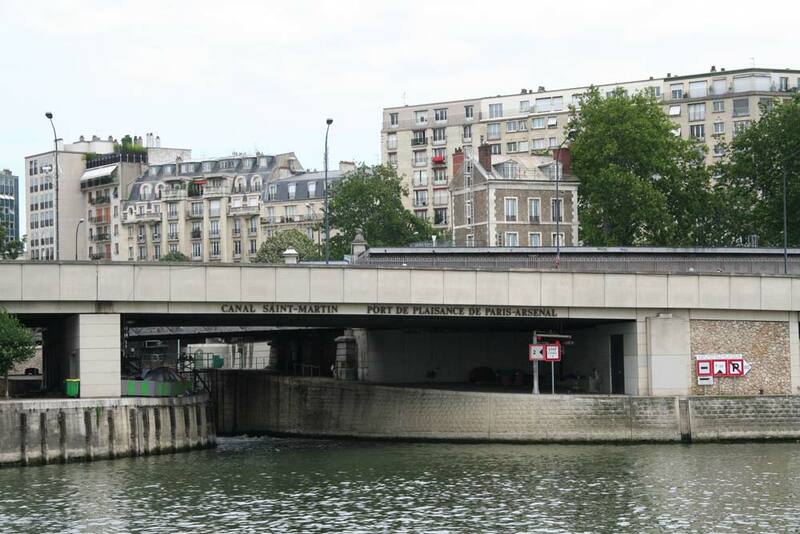 The only challenge came on arrival at the Paris-Arsenal, where a service pipe across the inner of the three bridges restricts the air draught to around 5.25m. With our 5.15m mast light we cleared it safely but it took the crew posted as look-out standing on two tool boxes on the cabin roof to judge the heights. The Paris-Arsenal was to our home for the next two weeks, whilst we received visitors from home, and made a return visit home ourselves. 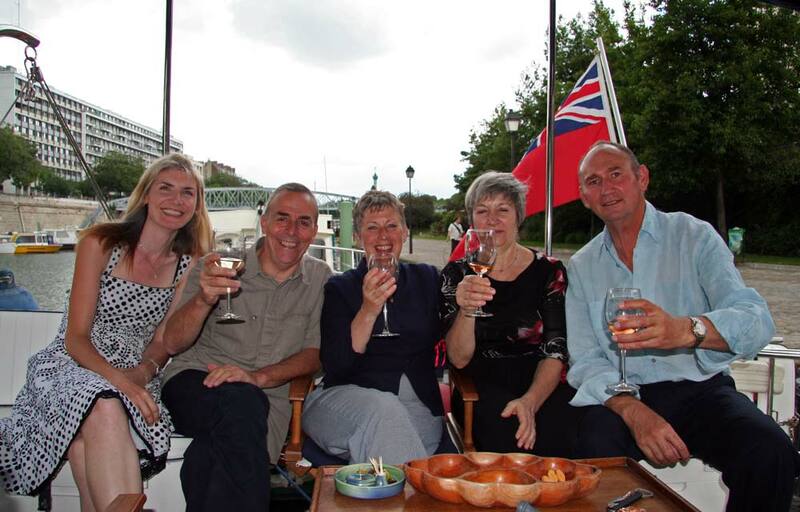 After several days in Paris, sightseeing and enjoying the comforts of the Paris-Arsenal, we welcomed our first guests, Sam & Francis, who arrived for an overnight visit on their way to a cycling holiday near Bordeaux. We were joined for the evening by their Parisian friend, Brigitte, who proved to be a invaluable source of education and enlightenment on useful French phrases which we could scarcely imagine needing, such as "Ciel! Mon mari..." .